There’s been a lot of talk about “toxic wheat” circulating the Internet, and even a lot of denial from farmers on social media about the use of glyphosate for pre-harvesting wheat. Perhaps even more than denial, is the fact that it is not a common practice, but it is a practice used in wheat farming nonetheless. In Alberta where we farm, our growing season is approximately 100 days, depending on the weather. Everything we do is timed, precise and done for a very particular reason. We start planting our crops in late-April/early-May, weather permitting of course. Due to our short growing season, among other reasons, we choose to use glyphosate to pre-harvest our wheat. One of the practices that is highly misunderstood is the application of glyphosate for pre-harvesting wheat, as I’ve already established. In layman’s terms, this simply means spraying our mature wheat crop with glyphosate before it’s ready to be harvested. 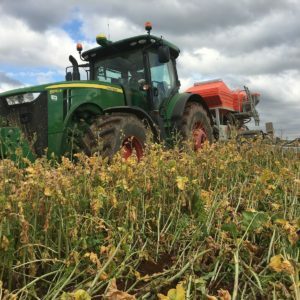 Though glyphosate is not a true desiccant (a desiccant is applied for rapid dry down and early harvest), it is generally used for weed control and can aid in dry down of crops, but the effects take much longer. This is done with care and precise timing, and is backed by science and regulated and monitored. It’s important to understand that we don’t just spray herbicides recklessly and certainly not needlessly. We aren’t going to spend money on expensive herbicides if we don’t need to. Just think about that for a moment. As a business, which our farm is, we want to make a profit and not lose it. 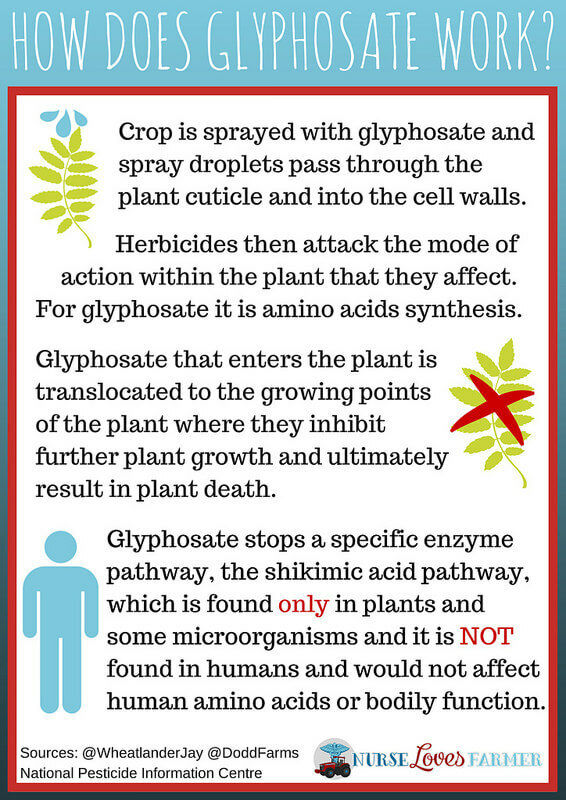 We see the accusation constantly that our crops are “drenched” and “doused” in glyphosate. I assure you, they are not. Glyphosate should be applied when there is 30 percent or less moisture in the seed, when the seed is firm and with reasonable pressure your thumbnail will leave a dent in the seed. We have a Crop Protection Guide to use and according to it, pre-harvest glyphosate must be applied seven to 14 days before harvest. If you apply too early it can potentially reduce yields and damage the quality. It’s also important to note that wheat is only one of 14 crops registered for pre-harvest glyphosate and there are other desiccants that are commonly used like Reglone, Heat and glufosinate on various crops. 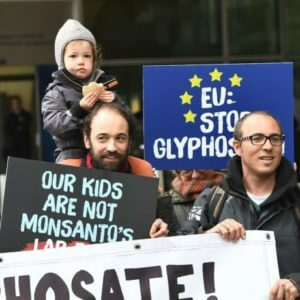 Is there solid research suggesting glyphosate is ‘dangerous’? The study that gets shared and starts misconceptions about glyphosate in farming stem from Stephanie Seneff, a very well known anti-GMO proponent, whom I’ve read about a lot in the last year. One of the reasons why my red flag goes up when Senneff’s name is behind research is that she’s a senior research scientist at the computer science and artificial intelligence lab at MIT with biophysics and electrical engineering degrees also from MIT. So why the research on glyphosate from an electrical engineer/computer scientist? Truth be told, she and her colleague didn’t conduct any research at all. Bloggers like Sarah Pope from The Healthy Home Economist, have a big misunderstanding about wheat and glyphosate. 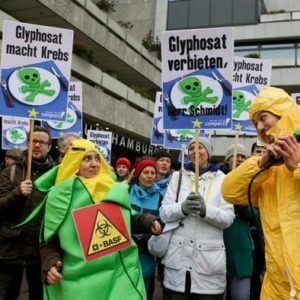 She states on her blog after reading Seneff’s paper: “When you expose wheat to a toxic chemical like glyphosate, it actually releases more seeds resulting in a slightly greater yield.” This is completely false. 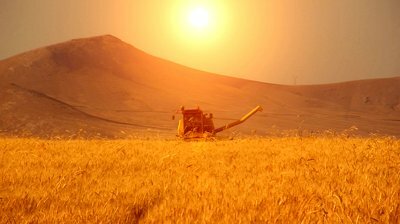 The yield of the crop is already determined because the wheat has stopped growing—their job is done, the plant is dead. When the plant isn’t green anymore, that means photosynthesis cannot occur or transport nutrients. Spraying glyphosate won’t magically create more kernels of wheat that late in the game to create higher yields, however weeds are still growing which can take away from yields for next year’s crop. Health Canada and the Canadian Food Inspection Agency (CFIA) sets and monitors maximum residue levels (MRLs) using scientific methodology far below the amount that could produce health problems. It is a very safe herbicide to use, even safer than vinegar as a herbicide. Caffeine is ten times more toxic than glyphosate! If accidentally consumed, glyphosate is excreted mostly unchanged in feces and urine, so it doesn’t stay in the body and accumulate. 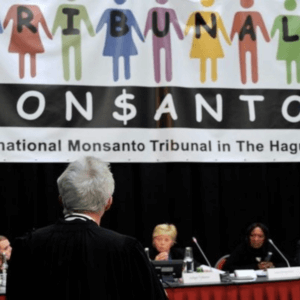 There have been no legitimate studies linking glyphosate to any human health ailments. I’m right there with him. It is so disheartening to see written that we grow “toxic wheat”. We take great pride in what we do for a living and part of that is being transparent and honest with all of you. I assure you, unless you have Celiac disease or a wheat allergy, the wheat we grow is not “toxic”. My farmer tells me that this practice is being used more all the time and that it’s important to note that the product can be misused. This is a practice that is common for our growing area, but may not be used by all wheat farmers. Farmers are not perfect and there needs to be better communication of why you can’t spray too early such as loss in yield and increased MRLs. As I already mentioned, we are up against the calendar with our short growing season. For example, the wheat harvested in our video was graded as number 1 (the highest) before it snowed and was graded as number three because of the snow after. A difference of about $0.50 a bushel and about an 8 percent decrease in value in one snow storm. Sarah Schultz is a nurse, farm wife, mom of two young boys, and blogger. She’s passionate about educating readers about agriculture and life on their grain farm near Calgary. You can follow her on Twitter@NurseLovesFarmr and on Facebook.